LATW’s ongoing Setting the Stage for Learning brings free recordings and standards-aligned materials to middle and high schools across the county, ensuring the arts remain a vibrant presence and valuable teaching tool. The program is designed to harness the power of professional theatre to deepen students’ understanding of complex literature and subject content, while engaging them through recordings of stage plays with a wide range of topics and themes. Our 2019 package in this free program includes two new recordings from our Relativity Series science-themed plays. We are also currently distributing a variety of plays from our collection to enrolled teachers. Enroll below to receive your free package and LATW’s full list of available educational titles. Please note that titles will be digitally delivered unless otherwise noted on the delivery format preference on your enrollment form. In April of 2010, British Petroleum gave orders to speed up production on its colossal drilling rig, the Deepwater Horizon. Despite the objections of many on the rig, safety measures were ignored or overlooked. On April 20th, the Deepwater Horizon exploded. Eleven men paid the ultimate price and countless thousands who call the Gulf Coast home found their lives irrevocably altered. 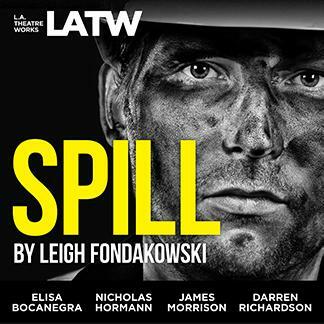 Spill tells the story of events leading up to the accident, and recounts the experiences of those most impacted. The recording includes a conversation with Jim Morris, Managing Editor for the Environment and Worker Safety for the Center for Public Integrity. Funding for the recordings and free distribution to teachers is generously provided by the Alfred P. Sloan Foundation. We believe that no student should face barriers to high quality educational tools. Plans for a new dedicated Educational Portal are underway, giving educators access to resources that include: free recordings organized by academic discipline and subject matter; curricular materials and educational tools; and a centralized section for teachers and students to post their feedback, discuss strategies, and share classroom experiences and teaching models.